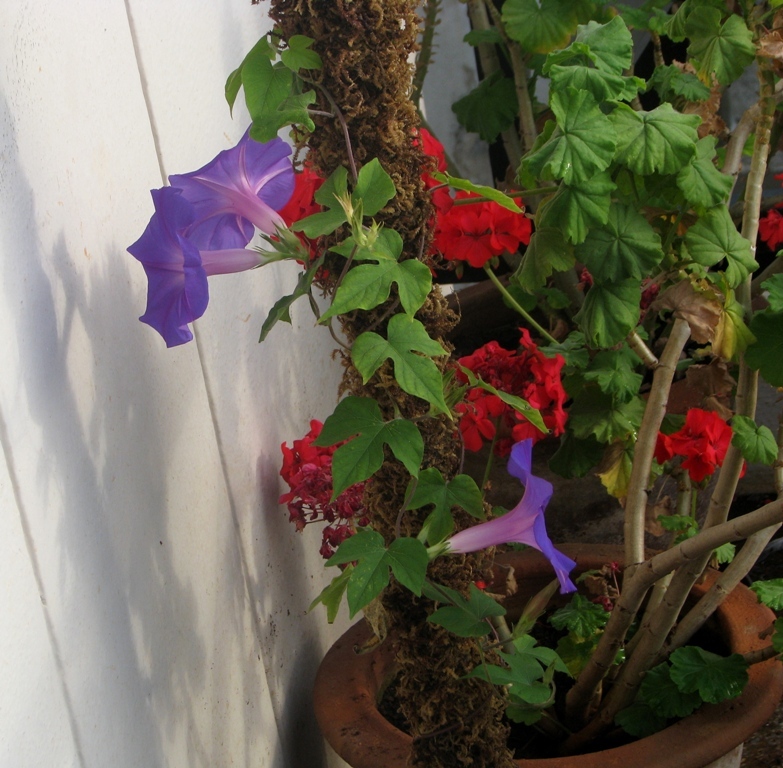 When morning glories along with many other bright flowers have blossomed in your garden, one knows that it’s a beautiful day; a joyful time. When one looks at an attractive flower, one is drawn within, towards the minute details of life, of joy; such as the moist mud, a ride during drizzle, warmth of a touch or simply a company midst cool and calm surroundings between the trees that has just had a good shower from the skies. And the joy is always a result of a peaceful mind that so many happenings collectively bring to you and it also is the harmony of thoughts with mutual admiration and acknowledgment of expressions and emotions that is so very complicated to tune. And this morning, its seems like all those beautiful feelings have settled on to the beautiful flower; in its pigments, maturing itself with the warmth of the sun. I have several additions to my garden now and will introduce them soon but here is a preview. One of these days, I made this painting for a friend whose wedding i failed to attend. I think I have finally found my style of painting – A blend of spray paint and acrylic/poster color. To make my already busy schedule even busier, I have joined weekend classes to learn French at Alliance Française de Bangalore. When I go to my French classes, I go to a place new to me, I learn a language that I have never spoken before; I meet people who have never known me before and hence it gives me an opportunity to re-explore or re-create myself. The class is very interesting and a lot of fun as everybody is equally new to the language and we learn through similar mistakes. The class is very diversified from a mother who wants to know if her kid is pronouncing the language properly to employees of a firm with French clients to those who want to migrate to Canada or France for job or higher studies or simply people like me who want to learn French to communicate during their travels or want to watch a French movie without subtitles. Bonjour. Je m’appelle Ajeya, Je suis indien. Je parle bien Kannada, Anglais, Tulu, Hindi et un peu francias. J’aime le cinéma, la peinture, l'Écriture et les voyages. So until next time à bientôt. One who enjoys traveling may know that sometimes a good travel experience may not even involve a place or a location at all but simply involves a journey; from one place to another or merely a journey of words through the interactions we have with localities or with the co-travelers. A long but exciting journey of 12 hours took six of us from office to Bijapur for a friend’s wedding. We reached the city by 9:00 AM, checked in to the hotel and freshened up. After a good breakfast, two other friends joined us and we drove in an auto to the marriage hall. Men and women traditionally dressed, gathered on this happy occasion and filled the hall with friendly gestures and greetings. Old men with traditional kurta, kache and turbans, women in an ilkal sari walked around the hall welcoming one another. After we wished the couple and with already un-digested breakfast struggled to relish the feast for lunch we hired an auto for Rs10 per head and drove to the Gol-Gumbaz. The entrée fee at this magnificent architecture is Rs5 per person and the guide (an Old man) we booked charged us Rs100 (but we ended up paying him Rs150 for his sincerity). With an old man with a walk stick as our guide the whole walk around the Gumbaz was a little slower than usual but he tried to make the demonstration interesting with his narration, examples and exercises. We next drove to the Ibrahim-Rauza, built by Ibrahim 'Adil Shah II (1580-1627), consists of his tomb and mosque within a square compound, both rising face to face from a common raised terrace, with a tank and fountain between them. A walk down the lane brought us to Malik- E-Maidan. The largest medieval cannon in the world placed here is 4 m long, 1.5 m in diameter and weighs 55 tons, this gun was brought back from Ahmadnagar in the 17th century as a trophy of war by 400 oxen, 10 elephants and tens of men. And a few furlongs gone is Uppali burj; built around 1584 by Hyder Khan, is an 80 ft (25 m) high tower standing to the north of Dakhani Idgah in Bijapur. This is a spherical structure with stone steps winding round the outside. While some of them left back to hotel, the rest of us walked to the Eidgah Maidaan where we requested the gardner to open the gates and relaxed for a while. Next we took a “Tanga” (Horse cart) to Barah Kaman – Bara Kaman is an unfinished mausoleum of Ali Adil Shah II. 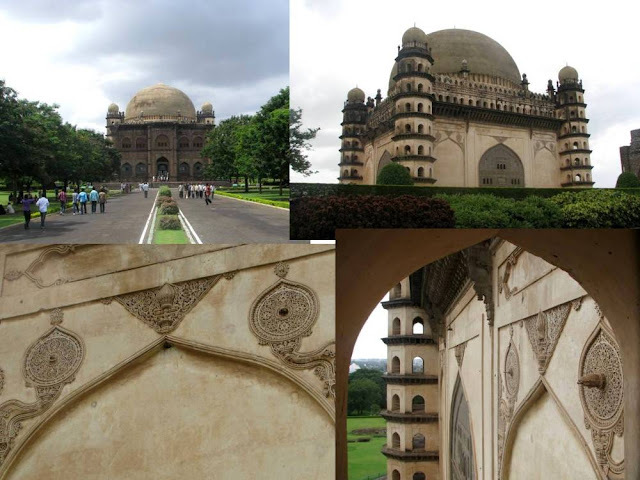 Ali Adil Shah of the Adil Shahi dynasty wanted to build a mausoleum of unmatched quality of architecture. As per the plan twelve arches was to be placed vertically as well as horizontally surrounding the tomb. However due to unknown reasons the work on the structure was left incomplete and only two arches were raised vertically. However still, the remains of the twelve arches placed horizontally can be seen. All the places except Gagan mahal close after 6 PM. Once back to hotel, we got ready to leave on another journey back to Bangalore. Every journey opens you to something unknown or unfamiliar. It brings to you the possibility of expressing yourself and exploring the unknowns. This journey was indeed very special for all the said and unsaid.